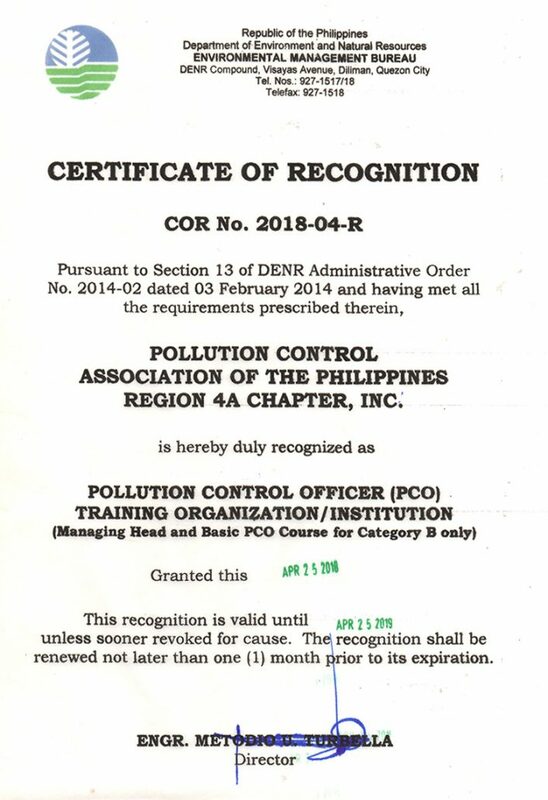 Pollution Control Association of the Philippines (PCAPI) Region IV-A Chapter, Inc. is a SEC-registered, non-profit, non-stock and non-political association which serves as a partner-organization of DENR-EMB in the dissemination and implementation of various training programs, environmental initiatives and projects. PCAPI R4-A also serves as a link between industry and the regulatory agency in working towards sustainable development. The Association serves its members by promoting environmental responsibility through training modules for Pollution Control Officers (PCOs) and members from basic to advance training; developing technical expertise, management skills, familiarity with all sides of environmental issues and networking to other environmental expertise. Serve as an effective link between government and the industry. Create environmental awareness through training, conferences, seminars and workshops. Provide necessary support in addressing issues and concerns related to compliance to environment regulations. 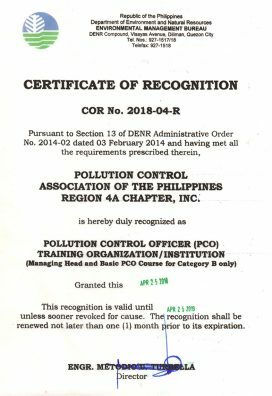 Assistance to the industry in the accreditation of PCOs, responding to environmental concerns of the industry particularly in the compliance to new and emerging government policies and regulations. Regular Board meetings are held every third Saturday of the Month. Special Board meetings are held as necessary. PCO Summit is held early part of 4th Quarter biennially. General Membership meeting is held early part of 4th Quarter biennially. PCAPI Region IV-A Chapter is represented by PCOs who elect among their respective sectors during the Chapter’s Biennial General Assembly.